Even with the cold winds, snow drifts and icy sidewalks of Minnesota, I can tell Spring is coming. There is a bit more light everyday, a few more eggs from the chickens, the dogs/kids/myself are all getting antsy to roam outside, and seedings are pushing up to greet the sunlight on every available surface close to a window. I may overcompensate for my garden desire (and try to squelch my cabin fever) by ordering an unreasonable number of seeds and starting them ALL. The seeds made me think of all the salads I’ll soon be able to enjoy. sigh… And dressings- lovely homemade dressings. You know I love those and have several posted, but I needed a new dressing. A dressing that is light and a bit sweet, equally at home with savory or sweet ingredients. One that tasted like the promise of Spring in a jar to tide me over until the ice melts. 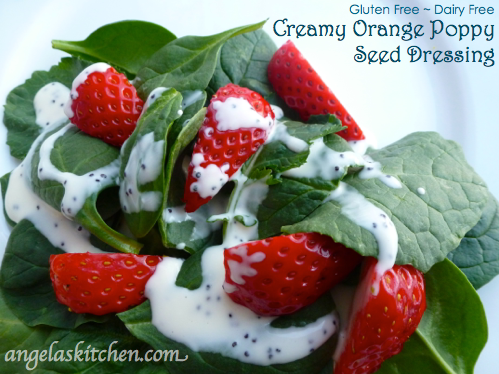 Creamy Orange Poppy Seed Dressing is lovely on a spinach salad dressed with berries or avocados (or both). I can’t wait to use it in a chicken salad with toasted walnuts and sliced red grapes or to drizzle it on ripe sliced peaches. Mmmm… This might be the dressing that gets me through. But if not, send some wool socks my way, will ya? Mix all ingredients together using a whisk. Cover and refrigerate, chilling before use. 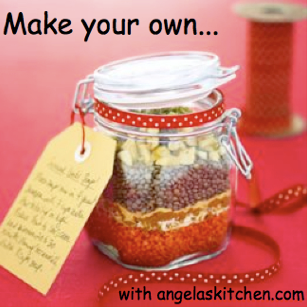 I am finally getting around to sharing this on Amy’s blog Simply Sugar and Gluten Free for Slightly Indulgent Tuesday. Go over and check out all the deliciousness shared over there. Yum!